One's of Liverpool's most distinctive pieces of art is moving to a new home. Superlambanana is being put on a low-loader and moved from the Wapping area of the city to Tithebarn Street. The seven-tonne sculpture has been outside the Joseph P Lamb and Sons building for several years, but the site is now being redeveloped. It will be placed outside the John Moores University Avril Roberts learning resource centre in the move on Thursday night. Councillor Mike Storey, leader of the city council, said: "Superlambanana has become a Liverpool landmark. "It was always intended that it would move around the city. It has been in Williamson Square , is in the south end of the city and is now moving to the north of the city centre." 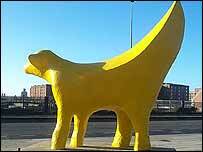 Superlambanana was designed by Japanese artist Taro Chiezo as part of the Artranspennine '98 festival.